Despite our best guesses, and that's all they were...guesses, the official fact sheet for Halo Reach has hit our inboxes. Even though there is a focus on six different Spartans in Noble Squad for the Halo Reach campaign, the game won't support six player co-op, but instead support the traditional four found in previous Halo titles Halo 3 and Halo 3: ODST. Though we're slightly disappointed at least Bungie took the steps to add in co-op matchmaking. The fact sheet goes on to say the game will support split screen, screen shots, videos, and "exciting new surprises" yet to be revealed. 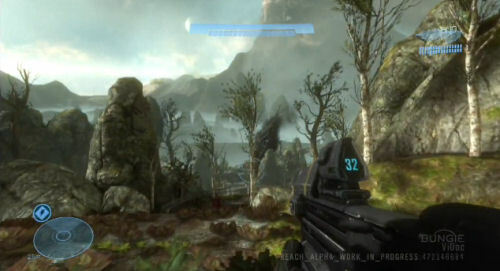 Amazingly we have the first video for Halo Reach that wasn't a "leak." In traditional Bungie fashion, we have the first ViDoc for Halo Reach today, and if any of the above news disappointed you, prepare to turn that frown upside down. The video shows off plenty of footage of the game, with looks at the new weapons, enemies, and environments. Perhaps most impressive is how the game is shaping up visually. The entire engine has been re-written from the ground up, characters and faces are motion captured, and there's lots of attention to detail found in the game world.